This project emphasizes the need to nurture one's personal creativity, in connection with the development of ideas for the consumer market. I needed to create a small batch of the product of my choice, and identify what it would take to move this product full scale. I have always really liked tea, from the ritual of making a cup, to the soothing results. Experimenting with Get Up and Go. The hibiscus turns the water pink. At this point I was very happy that I took glassblowing this semester. All my wobbly cups served as tasting vessels. Each portion was weighed and bagged in a zip bag before wrapped in the plastic burlap. I started with researching ingredients, then decided on the end effects that I wanted. Once that was decided, I purchased them through reputable websites and bartered with a local vendor. I couldn’t just blindly mix herbs together until I knew what they tasted like on their own, and when paired with others. This was a lot of trial and error. I ended up with three flavor profiles. I used cacao bean bags from the chocolate factory where I worked. They were readily available and simple to work with. The batch of 100 packages took three bags. The plastic needed to be burned after I sewed it, so it would not fray. Each pouch was kept shut with a string and button. The color of the string acted as a label in case the paper wrapping was lost or damaged. Finished bags hanging in my very lived in studio. The whole run. Each then was wrapped in a heavy paper label. Each pouch also had two tea infusers made from muslin. They could be rinsed and reused. Magnetic beads held the tea bag around the handle so it wouldn't sink to the bottom. 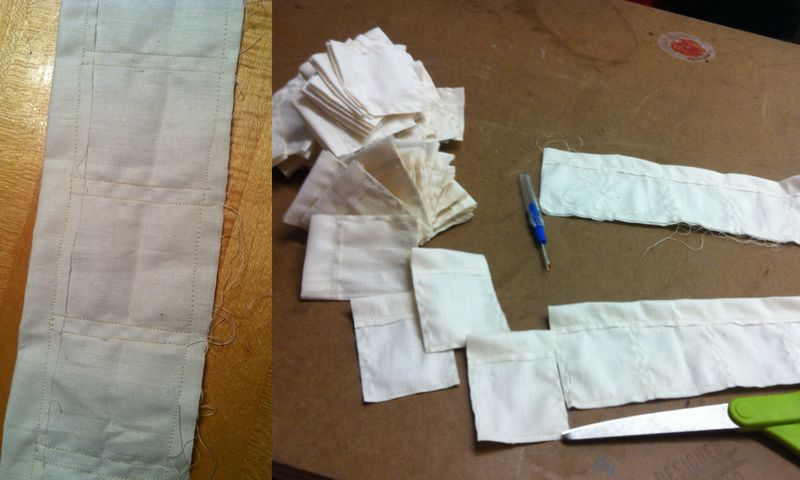 I used organic muslin and developed a pattern that would let me sew ten bags at once, then cut them apart. Nearly finished, adding the beads. A small pouch and two tea bags per unit meant a lot of sewing and detail work. I did my best to tap into my factory experience and streamline the process as much as possible. 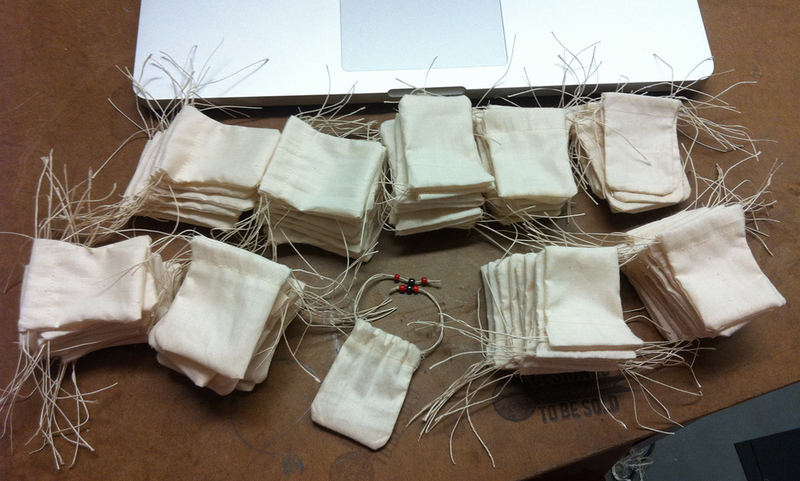 Sewing the packaging individually seems like it might take too long to be worth it. But for a relatively small batch I wanted make them myself. I double sewed, then burned the edges of the pouch so it wouldn’t fray. I wanted it to be obviously handmade. That way, each is unique, which provides visual clues to the care and attention brought to the process. The first retail location, a pop up shop. On the right, the final tea pouches on display. The remainder were sold to a gift shop. Improper Tea Co. in the window display. My classmates and I made a pop-up store. Open for one week only, Designed to Be Sold displayed our work. 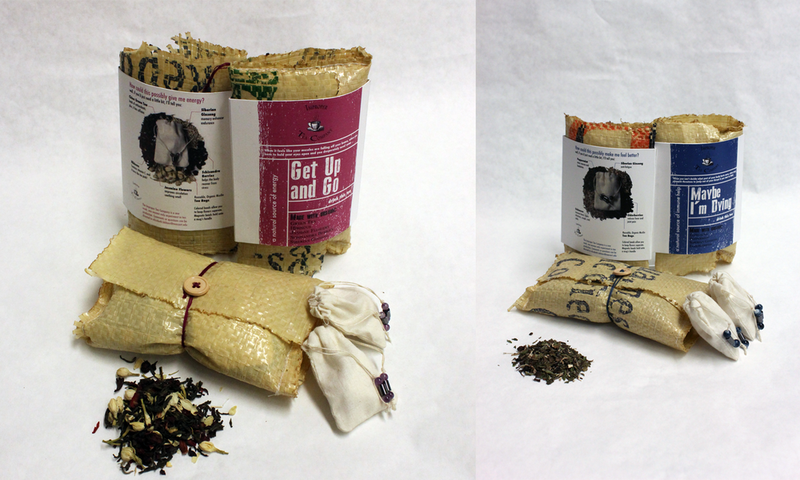 The packages was displayed with loose tea so the customers could smell the tea and see what they were buying. The remainder of my first run was sold in two lots to a small local gift shop. They found many ways to incorporate the unusual shape into their displays. Final calming blend and contents. 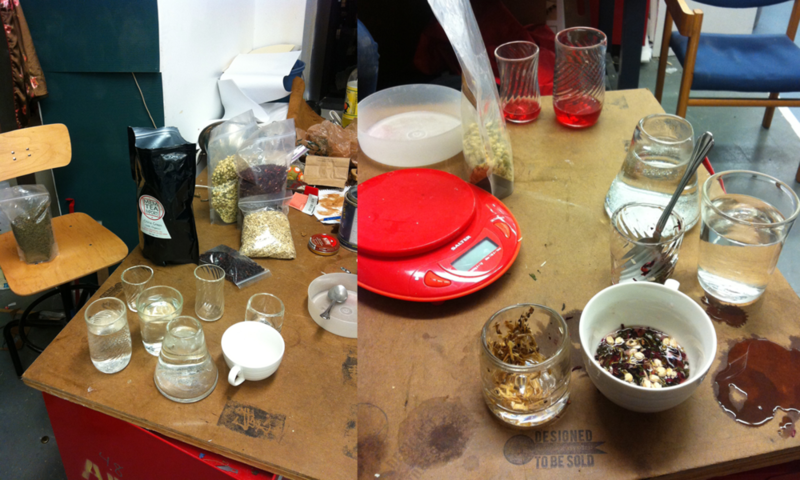 Left: final engergizing blend and contents. Right: immune support and contents.